For decades, pneumatic air tables have been the workhorse for reducing vibrations in cleanrooms for manufacturing and research, where critical micro engineering instrumentation is employed. But just as technology has steadily pushed the boundaries into nano-applications in microelectronics fabrication, industrial laser/optical systems and biological research, so has the need become ever more necessary for improved precision in vibration isolation. Vibration can be caused by a multitude of factors. Every structure is transmitting noise. Within the building itself, the heating and ventilation system, fans, pumps and elevators are just some of the mechanical devices that create vibration. Depending on how far away the cleanroom equipment is from these vibration sources, and where in the structure the equipment is located, whether on the third floor or in the basement, for example, will determine how strongly the equipment will be influenced. External to the building, the equipment can be influenced by vibrations from adjacent road traffic, nearby construction, loud noise from aircraft, and even wind and other weather conditions that can cause movement of the structure. Vibrations in the range of 2 hertz (Hz) to 20,000 Hz will influence sensitive equipment. But these internal and external influences primarily cause lower frequency vibrations, which are transmitted through the structure, creating strong disturbances in precision equipment used in cleanrooms. Used extensively in semiconductor manufacturing, biotechnology, the life sciences, and other fields that are very sensitive to environmental contaminants -such as dust, airborne microbes, aerosol particles, and chemical vapors - cleanrooms provide an enclosed environment with a controlled level of contamination that is specified by the number of particles per cubic meter at a specified particle size. The air entering a cleanroom from outside is filtered to exclude dust, and the air inside is constantly recirculated through high-efficiency particulate air (HEPA) and/or ultra-low particulate air (ULPA) filters to remove internally generated contaminants. Equipment employed inside the cleanroom must be designed to generate minimal air contamination. This includes vibration isolation equipment, which can range from relatively simple rubber blocks, metal springs and breadboards, to highly efficient air systems, active electronic systems, and Negative-Stiffness systems - constructed with more advanced technologies and materials for higher precision vibration isolation. are required to meet the same cleanroom and contamination standards that the components they are protecting from vibration must meet. Completely enclosed isolation modules and vented exhaust systems are also available to keep these workstations in compliance with cleanroom standards. All surfaces of the isolation table should be accessible for cleaning, and constructed so that they can be easily wiped to maintain cleanliness. Isolator diaphragms - for compressed air tubing and electrical supply - should meet the specified outgassing, nonvolatile residue and total mass loss specifications to keep molecular contamination to an absolute minimum. Air tables have been used since the 1960s for vibration isolation, and clearly have the widest installed base within cleanrooms. However, with the increased sensitivity in instrumentation, particularly at the sub-atomic level, more precise vibration isolation technology was needed to deal with lower-hertz vibrations, which were negatively influencing results despite the use of air tables. 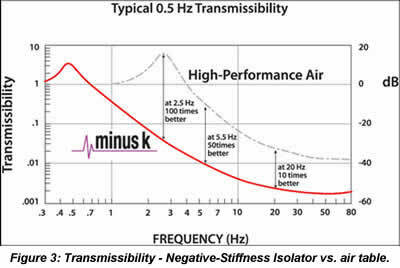 Introduced 20 years ago by Minus K Technology, Negative-Stiffness vibration isolation was specifically designed to isolate these low-frequency perturbations. Air tables do achieve isolation, but primarily in the vertical vector, with limited horizontal isolation. The horizontal vector is often overlooked because horizontal building vibrations are less obvious, but nevertheless, transmitted to the cleanroom instrumentation. 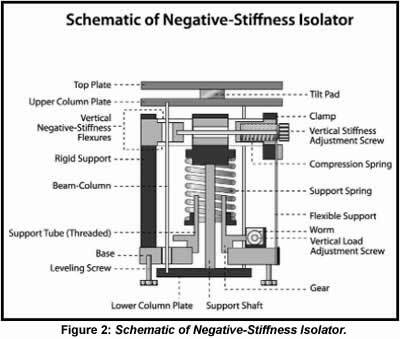 Negative-Stiffness isolators achieve a high level of isolation in both vertical and horizontal directions. Vibration transmissibility is a measure of the vibrations that are transmitted through the isolator relative to the input vibrations. Every isolator will amplify at its resonant frequency, and then start isolating. Air systems will actually amplify, instead of reduce, vibrations in a typical range of 1.5 to 3 Hz, due to the natural frequencies at which air tables resonate. The low-cycle perturbations will come straight through to the instrumentation. Air tables do not isolate to the extent that is really needed at very low resonance frequencies. Negative-Stiffness isolators resonate at 0.5 Hz - and in some cases at lower frequencies both vertically and horizontally. At this frequency there is almost no energy present. It would be very unusual to find a significant vibration at 0.5 Hz. Vibrations with frequencies above 0.7 Hz are rapidly attenuated with increases in frequency. When adjusted to 0.5 Hz, Negative-Stiffness isolators achieve 93 percent isolation efficiency at 2 Hz; 99 percent at 5 Hz; and 99.7 percent at 10 Hz. Some low-height Negative-Stiffness isolators provide natural frequencies of 1.5 Hz horizontal and 0.5 Hz vertically. Negative-Stiffness isolators have the flexibility of custom tailoring higher resonant frequencies when lower ones are not required. Pneumatic isolation tables operate on a supply of compressed air or gaseous nitrogen. When used in cleanroom environments (Class 10,000 and lower), the supply and exhaust gases need to be vented and piped out of the controlled areas, to ensure the gases will not contaminate the cleanroom environment. The air compressor, located outside of the cleanroom, is itself a source of low-hertz mechanical vibration. Negative-Stiffness isolators employ a completely mechanical concept, with no air or electricity required. There are no motors, pumps or chambers, and no maintenance because there is nothing to wear out. They operate purely in a passive mechanical mode. Vertical-motion isolation is provided by a stiff spring that supports a weight load, combined with a Negative-Stiffness mechanism. The net vertical stiffness is made very low without affecting the static load-supporting capability of the spring. Beam-columns connected in series with the vertical-motion isolator provide horizontal-motion isolation. A beam-column behaves as a spring combined with a negative-stiffness mechanism. The result is a compact passive isolator capable of very low vertical and horizontal natural frequencies and very high internal structural frequencies. If sensitive instrumentation in the cleanroom can be isolated from vibrations without having to deal with compressed air or electricity, then it makes for a system that is simpler to install, easier to set-up, and more reliable to operate and maintain over the long-term. Air tables are big and bulky, making them a tougher fit for the precious laboratory and production space requirements of cleanrooms. By contrast, Negative-Stiffness systems can be made to be compact, taking up very little footprint. Instrumentation can be positioned or moved around a facility without having to worry about feed-through for electrical power and air hoses. Large Negative-Stiffness workstations are also available when increased working space is required. Because of their very high isolation efficiencies, Negative-Stiffness vibration isolation systems enable sensitive instruments - such as scanning probe microscopes, laser-based interferometers, optical profilers and scanning electron microscopes - to be located wherever a cleanroom needs to be set up, whether that be in a basement or on the building's sixth floor. Extreme vibration-sensitive environments would not be practical locations for pneumatic isolation systems. As vibration-handicapped environments become more prevalent for the placement of cleanrooms, a better vibration isolation solution will be required than what has been available for the past half-century with air tables. It appears Negative-Stiffness vibration isolation is filling this void. Jim McMahon writes on advancements in instrumentation technology. His features have appeared in hundreds of publications worldwide.